Model of a B.E.A. Viscount. Note the square-ended propellers. After his briefing with M in From Russia With Love, James Bond is sent to Istanbul aboard B.E.A. Flight 130 to Rome, Athens and Istanbul. The four small, square-ended propellers turned slowly, one by one, and became four whizzing pools. The low hum of the turbo-jets rose to a shrill smooth whine. The quality of the noise, and the complete absence of vibration, were different from the stuttering roar and straining horsepower of all other aircraft Bond had flown in. As the Viscount wheeled easily out to the shimmering east-west runway of London Airport, Bond felt as if he was sitting in an expensive mechanical toy. 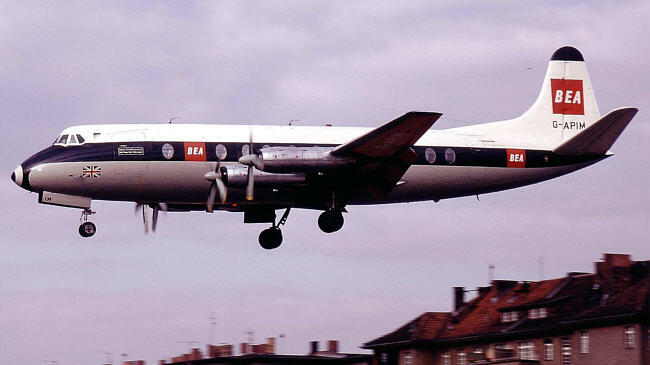 The Vickers Viscount by Vickers-Armstrongs was a very important plane in the history of passenger air travel. It was the first gas-powered turboprop airliner, and the short to medium range plane featured much improved cabin comforts such as pressurisation, and reductions in vibration and noise – as noted by Fleming above. 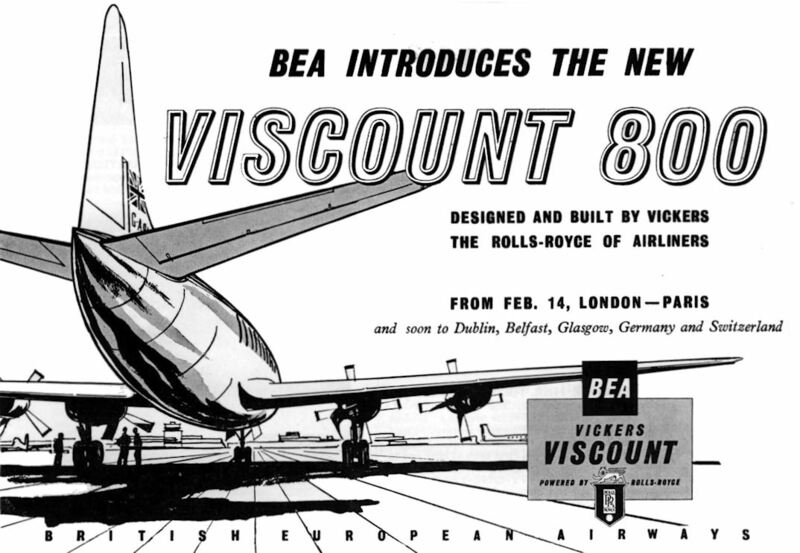 You read just about everything you’d want to know about the Vickers Viscount on the Vickers Viscount Network. Most of the flight went smoothly, though there was a rough patch which had Bond slightly nervous. Bond smelt the smell of danger. It is a real smell, something like the mixture of sweat and electricity you get in an amusement arcade. Again the lightning flung its hands across the windows. Crash! It felt as if they were the centre of the thunder clap. 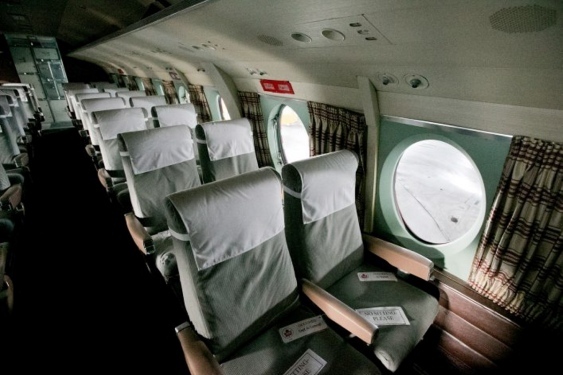 Suddenly the plane seemed incredibly small and frail. Thirteen passengers! Friday the Thirteenth! Bond thought of Loelia Ponsonby’s words and his hands on the arms of his chair felt wet. How old is this plane, he wondered? How many flying hours has it done? Had the deathwatch beetle of metal fatigue got into the wings? How much of their strength had it eaten away? Perhaps he wouldn’t get to Istanbul after all. Perhaps a plummeting crash into the Gulf of Corinth was going to be the destiny he had been scanning philosophically only an hour before. Ironically, about a year after this was written, (Fleming’s author’s note is March, 1956) on March 14, 1957, a B.E.A. 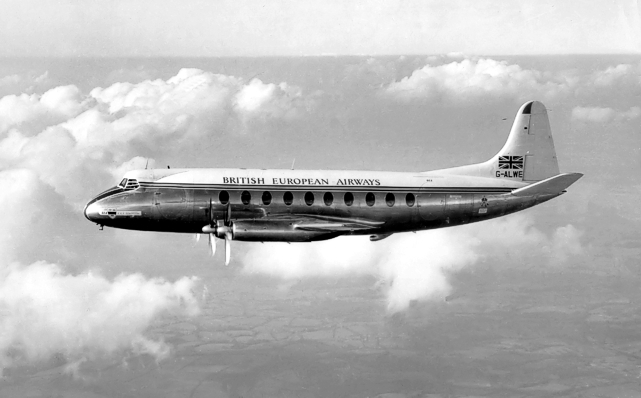 Viscount crashed at Wythenshawe on approach to Manchester, England, killing all 20 on board. It also killed two people on the ground. The aircraft had logged a total time of 6,900 hours and 4,553 landings, and part of the reason for the crash was cited as metal fatigue. Among other routes, this aircraft had done the London>Rome>Athens>Istanbul one. Could this have been the very plane Bond was worried about? While not as luxurious inside as some of the long-haul aircraft Bond has flown on, such as the Super-Constellation or the Stratocruiser, the Viscount was very comfortable for the shorter flights across Europe. It was certainly a step up from the Ilyushin 12 which Donovan Grant had flown to Moscow not many weeks before. 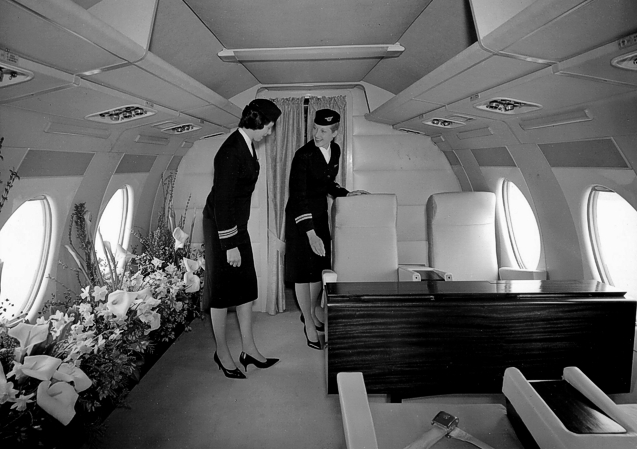 Undated shot of interior seating of Viscount.